Marvel's highly-anticipated Spider-Man: Homecoming 2 is already shaping up to be a much bigger production than its predecessor, with a report from January claiming that production will start this June in Berlin. Today we have yet another report that claims this production will truly be a globe-trotting affair, with production also slated to take place in London, Venice and Prague, although this new report does not mention Berlin as a location that will be used for the production. If this latest report is to be believed, it also seems that production will be getting under way even earlier than previously reported. There was another report that surfaced in January which revealed that filming will start in June, although another report later that month claimed the start of production date will be on May 28. Now this latest report claims that production will start on May 19, with filming slated to wrap in September. This report doesn't reveal exactly where production will begin, out of all these locations, nor does it reveal which of these will be more prominent than others. This will certainly be a big change of pace from Spider-Man: Homecoming, which was predominantly set in New York City, with scenes filmed in Washington D.C. and Berlin as well. This report also comes after a report in January revealed the sequel will be casting a mysterious femme fatale character, with Marvel reportedly seeking European actresses for this role, which many have speculated could be a younger version of Felicia Hardy, a.k.a. Black Cat. This character's identity has still not yet been confirmed at this time, although there was another interesting audition tape that surfaced in December, with French actress Louna trying out for the role of Gwen Stacy. Bringing Gwen Stacy into the story is one thing, but making her a European character would represent a huge difference from the comics. While no official story details have been released yet, it has been confirmed that Spider-Man: Homecoming begins just a few minutes after the events of Avengers 4, which hits theaters on May 3, 2019. Spider-Man: Homecoming 2 arrives just two months later on July 5, 2019, and it has been confirmed as the first Phase 4 movie, and the third MCU movie of 2019, following Captain Marvel (March 8, 2019) and Avengers 4. Since there is very little revealed about Avengers 4, it's difficult to understand how that movie will affect Peter Parker and the rest of his high school friends. But the Seinfeld inspired working title The Fall of George hints that Peter may be in for some rough days. There had been reports that Spider-Man: Homecoming kicks off a new trilogy, with each movie representing a new year in high school for Peter Parker (Tom Holland). Peter was a sophomore in Spider-Man: Homecoming, which likely means that he will be a junior in Spider-Man: Homecoming 2, with Spider-Man: Homecoming 3 set during his senior year. 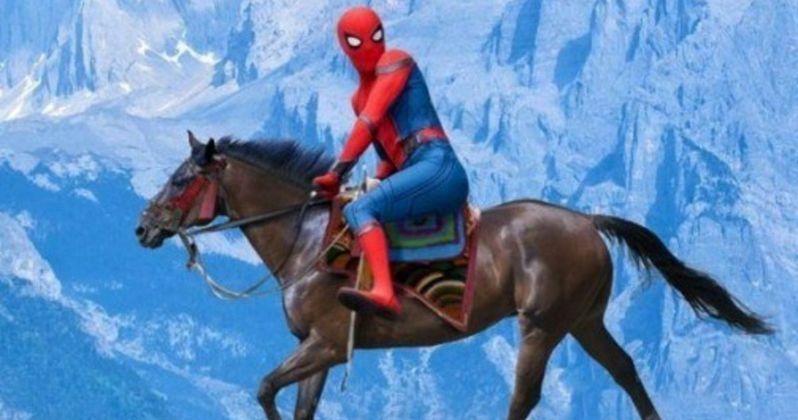 Jon Watts is returning to direct this Spidey sequel, with original Spider-Man: Homecoming writers Chris McKenna and Erik Sommers coming back to write the sequel. This new report came from the latest issue of Production Weekly, courtesy of Prague Reporter.